In our earlier blog, Benefits of Providing Free Shipping on your eCommerce Store, we had looked at how free shipping can be extremely beneficial for your business. If you have not already read that we encourage you to do the same. Are you convinced that free shipping is the right way for you to move forward, but not sure where to begin? Then you are at the right place. In this blog, we will look at 12 different ways in which you could provide free shipping to your customers while controlling the costs that you incur. While some are completely in favor of your customers, others offer a win-win for both you and your customer. Businesses that maintain their own warehouse to stock products, usually tie up with fulfillment providers to pick packets for delivery from their warehouse. Fulfillment providers incorporate the costs associated with this additional step, of picking packets from the warehouse, in the price they quote. Businesses can reduce this cost by stocking their most popular products with the fulfillment provider; who can then directly ship those products from their warehouse. Stocking products with fulfillment provider reduces the distance packages must travel thereby reducing the cost of those shipments. While businesses pay an additional fulfillment service fee, the costs associated with that are much lower than what they save in the shipping charges. Not all businesses can afford to offer free shipping to all their customers. Businesses can start by offering free shipping only for orders from specific locations (delivery locations) where they have their fulfillment centers or retail stores. And for other locations free shipping could be offered for orders above a certain minimum threshold; the threshold value could be less for neighboring location and higher for away locations. Free shipping to retail stores (buy online pick up in store) is gaining a lot of popularity with retailers with physical stores – a number of retailers have even added pick up in store as a shipping method to the list of options available. While customers benefit by saving on shipping charges, retailers benefit from the increased footfall, in the physical store, that can lead to in-store purchases. With most shipping providers calculating the shipping costs based on the weight and dimension of the package, the right packaging can have a significant impact on your shipping costs. Optimize the box/ packet size and use the right material to control your shipping costs. But, a word of caution – it is very easy to get carried away and over doing this. While it is important to optimize the packaging never compromise on the end customer experience; because bad packaging can damage products, etc. According to a survey by TrueShip, nearly 20% of returns are due to the product being damaged. According to another eCommerce Packaging Survey report, over half of the consumers were more likely to make another purchase from an online retailer when orders included premium packaging. So optimize your packaging without compromising on the customer experience. There are multiple ways to link free shipping with customer loyalty. Only Loyal Customers – Offer free shipping only to your loyal customers (customers in your loyalty program) as motivation for them to stay loyal to your business. According to an eCommerce customer survey, 31% of online shoppers join a loyalty program to qualify for free shipping. Paid Membership – Ask your customers to upgrade and join your paid membership program – charge them an annual fee in exchange for free shipping. A strategy very well adopted by Amazon – According to a 2015 report from Consumer Intelligence Research Partners, Prime members spend an average of $1,500 per year on Amazon.com, compared with $625 per year spent by Amazon customers who aren’t Prime members. This can be a great way to make free shipping affordable while increasing the customer lifetime value/loyalty of your customers. As Referral Reward – In a 2015 customer loyalty study, it was found that 31% of consumers are willing to recommend new customers to the brands who provide free shipping. Ask your customers to refer new customers and reward them by providing free shipping. When used effectively this will not only improve customer loyalty but also help you gain new customers. Setting the minimum threshold is a very commonly used technique that compensates for the cost incurred in providing free shipping with the increase in average order value. Setting minimum order value thresholds encourages larger orders and reduces the risk for businesses. In a study conducted by Red Door Interactive marketing agency, it is found that adding a free shipping threshold to NuFACE (an anti-aging skin care company) increased its orders by 90%. But the key to getting this right is setting the right threshold. Set it too high, and it will not increase the order volume and do more harm than good by drawing their attention to the fact that they are not getting free shipping. Set it too low, and it will impact your margins. Analyze the average order value data you already have and then decide the threshold. And when you do select a threshold and implement this, make sure that you have processes in place to inform your customers about this (popup message, banners, etc.). An increasing number of customers today wish their product to be delivered in a day or two. Amazon has invested billions and continues to invest more, to make same-day and next-day delivery an option for lots of customers. Businesses can use this to their advantage by offering free shipping across the board but asking customers to pay a premium for priority handling (same-day or next-day delivery) or rush shipping – a freemium business model for shipping. From businesses perspective, this does not necessarily mean using pricier shipping options and can be achieved by reducing the handling time (order processing time). This way, a minority of customer will fund free shipping for the rest of customers. Read Automate Order Fulfillment with an Integrated Solution to find out how integration can help you improve your order processing time. Businesses do not necessarily have to offer free shipping throughout the year. For most businesses, there are certain times in a year which account for the bulk of their annual sales – like the holiday season. Free shipping, during those times, can give you that competitive edge to do better. High Margin Products – High margin products provide businesses the cushion to absorb the cost of providing free shipping. Old Stock/ Over Stocked Products – Free shipping is known to increase sales for most products. You can clear that extra stock lying in your warehouse by offering free shipping on them – not only increasing sales but also depleting the excess inventory that you hold. Low Selling and Highly Competitive Products – Give your low selling, say out of season products, and highly competitive products the additional push it needs to increase sales. 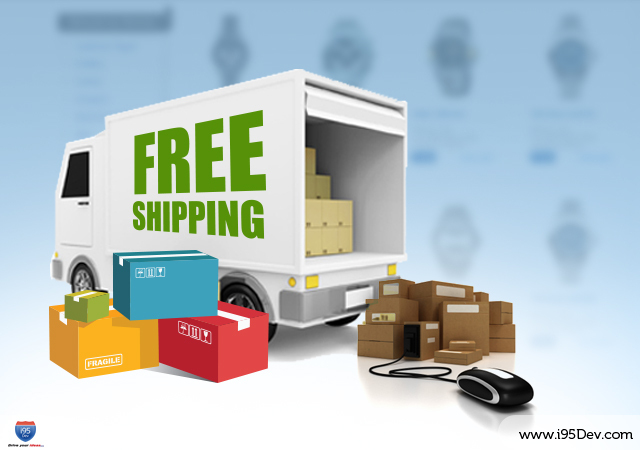 Others – You could consider offering free shipping on other products like products for which the shipping costs are low. In a Forrester survey, nearly 38% of consumers said that they have bought from a specific online retailer because of free shipping. Free shipping is necessarily evil for a number of businesses and offering free shipping on all products a mandate. A study conducted by BCG found that shoppers want free shipping more than they want lower prices for the product they are buying. One way to offer free shipping is to include the cost of shipping in the price of the product and offer free shipping. Businesses often use this technique to attract traffic to their website. But, it is important to keep in mind that this can negatively impact the trust which customers put in the brand. Nearly 60% of eCommerce companies find free shipping as their most successful marketing tool. Free shipping can be used as marketing and promotion tool in so many ways – offer it as a coupon, use it on social media, offer it as a limited period deal, free shipping on next purchase, free shipping on referral, etc. But, businesses using this must make sure that they do not over do this. It is very easy to lose focus of your product and its value proposition and give too much emphasis to the promotion, here free shipping. Returns today play an important role in customer’s purchase decision. According to trueship.com, 79% of customers want free return shipping. In another survey, it was found that free returns can help drive higher eCommerce sales for big-ticket items – nearly three times as many consumers would purchase a product online costing more than $1,000 without seeing it first if returns were free. Free returns can increase your conversion and sales by giving customers the confidence that they could return the product, at no additional cost, if they do not like it. Businesses do not have to limit themselves to one or more of these strategies. It is important to test multiple options and find the ones that best work for your business. In our next blog, we will discuss how businesses can evaluate if free shipping is right for them, stay tuned! !